The KeepVid website might be familiar to many people, especially who often download videos from Youtube. I’ve actually used the free online service a few times and it works very well. 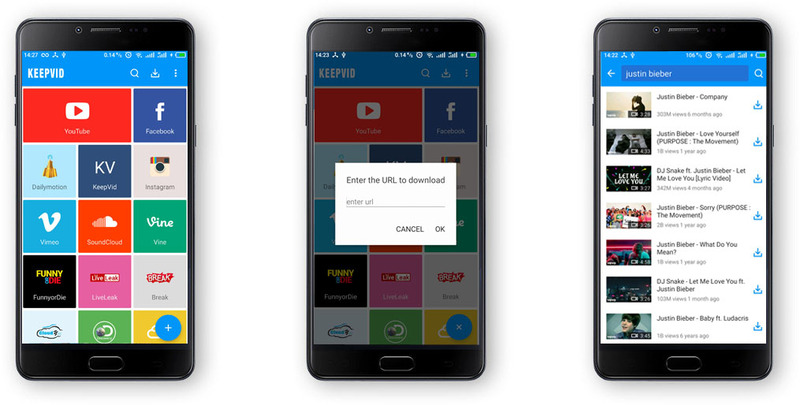 Now, they’ve released the KeepVid app for Android which would help you download videos easier and you can also download Youtube to MP3 directly on your smartphone. Let’s check out the app to see if it’s the best video downloader for Android. I’m a little disappointed since the app is not available on both Google Play Store and Apple App Store. The only way you can use it is to download the apk file and install manually on your Android smartphone. Anyway the process is not complicated and takes less than a minute. The app has a very nice and simple interface. Upon launching, you will see a simple screen with some of the most popular video-streaming sites like Youtube, Facebook, Vimeo, or DailyMotion. In case you want to download a Youtube video, just tap on the Youtube icon, you will be navigated to the Youtube website. There you will be able to find videos and to download one, you just need to tap on the download button on the lower right corner. The last step is to choose the video and audio quality. You can save it as audio only and get some music files for free, however, the audio quality of Youtube is just at an acceptable level because it is often compressed when videos are uploaded. A limitation of the KeepVid app is that it works with Youtube website only. You can’t just open the Youtube app and download files. Fortunately, you can also search for videos within the app, so it will save a lot of time when you need to download videos in bulk. Overall, the KeepVid is a good Android app and helpful for anyone who wants to download videos online. Thank you for sharing KeepVid Review. It’s really interesting app for free video downloader. I must try this.